The Enso HD Chef's Knife is designed for slicing, dicing, and chopping a full range of fruits, vegetables, and more. 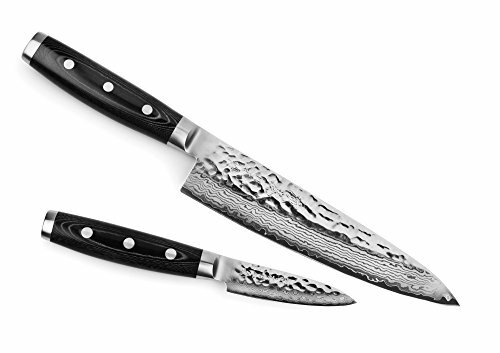 With its curved belly, the Chef's knife can be gently rocked through fresh herbs or spices to produce a very fine mince. The Enso HD Utility Knife is ideal for a multitude of small tasks where more precise cuts are needed, such as trimming broccoli, green beans, or other smaller vegetables. The Enso HD Paring Knife is ideal for peeling, coring, trimming, decorating, and other detail work. Also can be used for chopping small foods, such as garlic cloves or ginger. Enso has been crafting professional knives since 1932, combining the best of advanced technology with the unsurpassed knowledge and expertise of traditional craftsmen. Enso continues to pursue new possibilities for kitchen knives in the new era, and to work on maintaining and improving manufacturing technologies to produce the highest quality products. Handcrafted in Seki City, Japan with a lifetime warranty. If you have any questions about this product by Enso, contact us by completing and submitting the form below. If you are looking for a specif part number, please include it with your message.